Rabbi Micah Peltz writes about the history of diversity within Judaism, as evidenced by the 2000-year-old Dead Sea Scrolls. The Dead Sea Scrolls have come to Philadelphia. This exhibit at the Franklin Institute has generated much excitement in our community. Though I have seen the scrolls at their home at the Israel Museum in Jerusalem, visiting them in the United States proved to be a different experience. I was surprised, though perhaps naively, to see people of all different faiths, ages and backgrounds at the exhibit last week. 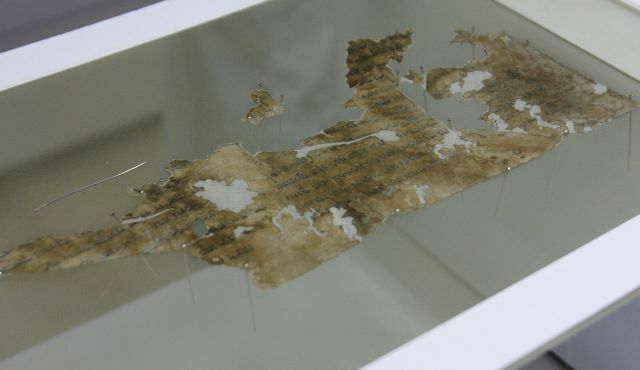 What is it about these 2,000 year old scrolls that attract so many people? Why do they inspire so much interest and fascination? With over 900 scrolls identified to date, the Dead Sea Scrolls are the oldest known surviving copies of biblical and extra-biblical texts. Perhaps this fact alone is appealing to a broad audience today. In our ever-changing world, these ancient scrolls give us hope that some things can indeed survive well beyond us. The writings of the Dead Sea Scrolls are familiar; many of us still study them today, some 2,000 years after they were written. That’s because the collection contains nearly every book of the Hebrew Bible as well as many other important texts. While many of those biblical texts are identical to how our bible reads today, there are differences as well. What emerges from these differences is not a community that is careless with its sacred texts, but rather one that takes its texts seriously. Throughout Jewish history, there has been much diversity. There were Pharisees and Sadducees and Essences, and all sorts of other sects who each tried to approach God in different ways. While none of these sects have survived today exactly how they were 2,000 years ago, the ideas of some have fared better than others. Perhaps this is because of the quality, or even the Divine preference, for those ideas. Or maybe it is a just a coincidence of history. Either way, the diversity of approaches in ancient Israel can be instructive for us today. The different interpretations of Judaism that exist today are not quite as diverse as those at the turn of the millennium, but there certainly remain different approaches to Jewish theology and practice. Like our ancestors, we don’t know which brand of Judaism is the most correct or authentic. We might have faith in the authenticity of our own particular approach, but with faith must come humility. None of us can ever be entirely certain that we are right. Indeed, this is the basis of religious pluralism, which happens when we are each able to say, “I respect your right to be wrong.” We may not always agree, but, as these first nine days of the month of Av remind us, when we lose the ability to respect one another we suffer as a people. It was this sinat hinam, this senseless hatred, that the Talmud says led to the destruction of the second Temple in 70 CE on the 9th of Av, which we will mark on Sunday. A disaster that not only brought down the Temple, but that also led to the ultimate extinction of many of those ancient Judaisms, including the people at Qumran who wrote the Dead Sea Scrolls. In the excavations of Qumran, archaeologists also found 30 pairs of tefillin. I saw a few of these pairs on display at the Franklin institute in Philadelphia and it reminded me of a beautiful teaching I once heard about tefillin. Each of the two boxes of the tefillin contains four sections from the Torah. In the head tefillin, these four sections are written on four separate pieces of parchment. This symbolizes the diversity of opinions about Jewish thought and practice that exist in heads of Jews. In the arm tefillin, however, these four sections are all written on one piece of parchment. This symbolises how we are to act with unity in matters that affect the wellbeing of the entire Jewish people. It’s okay, and maybe even desirable, to have different opinions about Jewish practice. But this diversity of opinions cannot affect our ability to act as a unified Jewish people when faced with challenges. When tested, our ancestors were not up to the challenge and the second Temple was destroyed. When faced with the next challenge, will we be able to put our different opinions aside and act as one? Rabbi Micah Peltz is a conservative rabbi at Temple Beth Sholom in Cherry Hill, New Jersey. Reprinted with permission from www.haaretz.com.